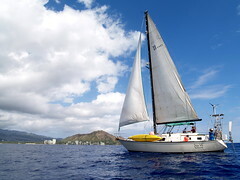 Puka Wai, my sailboat and home for the last 6 years will soon be going to a new owner. To give her a proper send-off, I would like to invite all my fellow pilots and friends to go for a sail and a barbeque on July 4th - this Friday. If you would like to come, please RSVP asap. Berndt, that sounds like a great plan! I wish I could join you, but I am leaving Thursday night for the Rat Race. Have a great time, and say bon voyage to the old girl for me. Alex, Sorry we'll miss you. If the weather cooperates, the sail will be long enough to ponder this macabre fascination with chasing rodents in the Oregon desert! Thanks for the invite, but I am committed elsewhere. 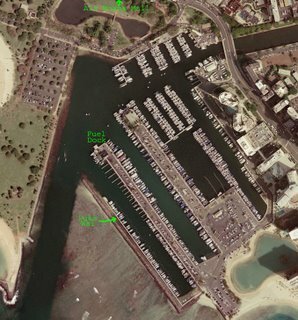 Make sure you stop by Waikiki, because the Flotilla is on this year. It is centered on the guise that everyone is out there to watch the McFarlane Regatta canoe races. But, actually it is an excuse for a floating party, with plenty of young skin and general debauchery. Plumpus will be cranking out the tunes live on the party barge and it usually gets nuts. I am sure Frank will have his boat out there as well. Remember: If it Floats, Flies or F__ks, Rent It! I wish I'd know earlier. Hillery & I would have loved to have gone. Unfortunately, we already have plans. Drink a cold one (or two) for me. I'd never really given your chatter box moniker any thought but now that I know it's the name of your boat it makes much sense. Sorry I can't join you and I hope the post partem depression is short. Very glad the boat is going and you're staying as oppossed to the other way around. Hope to see you soon.